I would like to hear any interesting experiences you've had while keeping live rock? Any notable experience, good or bad, is valuable. I'm especially interested, though, in anything you are glad you did or regret doing when adding live rock to a tank. Would love to find a baby mantis shrimp! Also love finding ones that have barnacles like this one that is covered in them! i've heard of bristle worms, are they a bit bitey? Bristle worms are basically equivalent to fiberglass on steriods. Tip if you brush into one use can use tape to pull the spines out. I love that my puff will actively search the live rock for critters. And at night mine have a colony of micro brittle stars that come out. Welch4 wrote: Bristle worms are basically equivalent to fiberglass on steriods. Tip if you brush into one use can use tape to pull the spines out. I love that my puff will actively search the live rock for critters. And at night mine have a colony of micro brittle stars that come out. yeah i'm looking foward to giving my gsp something to entertain himself with. is ur tank FOWLR? how often do you do water changes? Gotta catch em all, Pokemon! I always have really bad luck with pics, about the only good one ive taken is my avatar. Wouldnt exactly call it a reef tank as all my frags are pretty small but. . . Frogspawn, blue green and orange mushrooms, candy, trumpet, fungiplate, green star polyps, kenyan leather, toadstool, 4 colors of zoas, 2 colors of acans, black sun, and a small forest of pulsing zenias. The only thing the little guy won't stand in his tank are feather dusters. But it is his tank so I fully understand if he decides to eat all of the corals some day. As i havent gotten my skimmer yet i just monitor my nitrates. 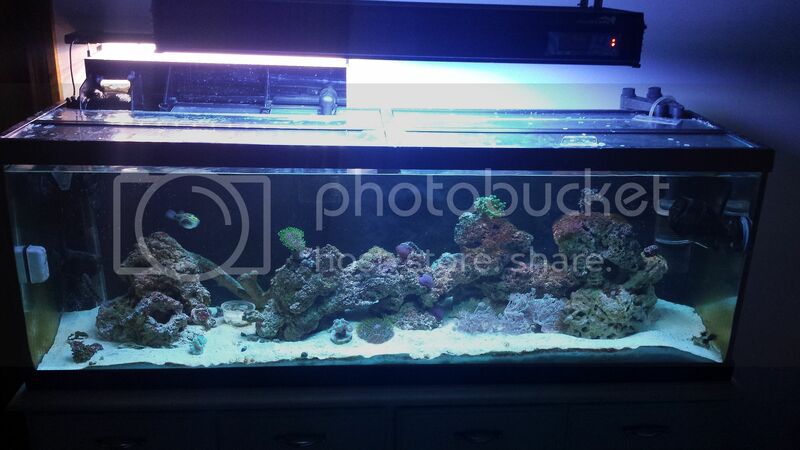 Depending on how heavily i feed the corals i do a 20 or 50% weekly or every other week to keep my trates sub 15ppm. I am also running a small hob fuge with mud/cheato and an aquatic life edge fixture. I know this was a primer. Ill see if i can use some suction to get one to an area that i take a pic. So about all ive been able to get a pic of are two arms starting to come out of a crevice. Seems like whenever one is about the come out a hermit or an emerald crab will scare hem back in. Ill keep trying. Oh, I've had brittle stars, a gorgeous red mushroom, a rather unique looking aiptasia that my fiance forbid me from smiting, bristle worms, a couple of polyps, sponge, and other critters I couldn't even begin to identify. Alas, I was forced to tear down my tank, and all of my live rock is quite dead now.